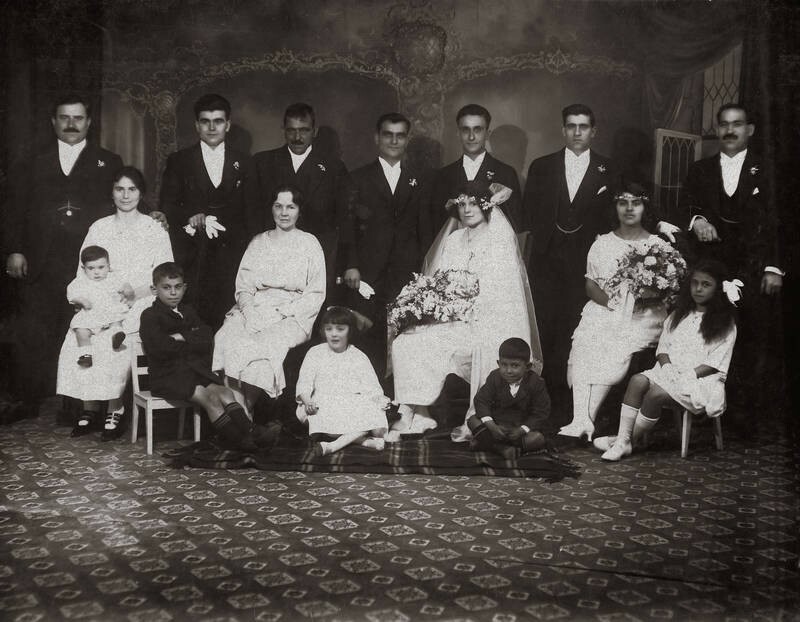 Seated, L to R: Marouli Faros (with child on her lap), Unk, Velio Tzortzopoulos ( bride), Bridesmaid with flowers – Dora Bylos ?? Front: Unk, Unk, Unk, Ami Comino? can anyone help with identification of other people?? "A unique but pretty wedding was celebrated at the Marble Bar, Auburn street, on Thursday, when Mr. Angelo Bylos, son of Mr. and Mrs George Bylos #, was married to Miss Violet Poulo. The officiating ministers were Father Nicholas Staidie, of Redfern, Sydney, and the Ven. Archdeacon Ward, of Goulburn. The Bride, who was given away by her father, wore a charming gown of white satin and georgette embroidered with pearls, her train being borne by Miss Ami Comino. The bridesmaids were Miss Flascas, who was dressed in pink georgette with lace trimmings, and Miss Bylos, who was attired in pink crepe de chine. Mr. Anthony Flascas was best man. Following the ceremony, a reception was held at the Marble bar, the guests including Mr. and Mrs. Poulo, Mr. Con. Bylos, Mr. P. Stathis, Mr., Mrs. and Miss Potiri, Mr. and Mrs. Aroney, Mr. and Mrs. G Comino, Mr. T. Comino, Mr. and Mrs. John Faros, .Mr. J. Mallick, .Mr.Jack Solomon and Mrs Hall. Mr. and Mrs Bylos left for Sydney where the honeymoon will be spent, the bride traveling in grey gabardine coat frock, hat and shoes to match. Mr. and Mrs Bylos intend to reside at Cowra".